The pool products distributor shrugged off concerns over the housing market, and the stock recovered strongly in November. Shares in pool and irrigation products company Pool Corporation (NASDAQ:POOL) rose 11.5% in November, according to data from S & P Global Market Intelligence. A quick look at the price chart speaks volumes about what's happened in the last few weeks for the company. As well as distributing irrigation and outdoor living products, Pool claims to be the world's largest independent distributor of swimming pool supplies, and the second and third quarters are the most important ones for the company -- they cover the summer months. 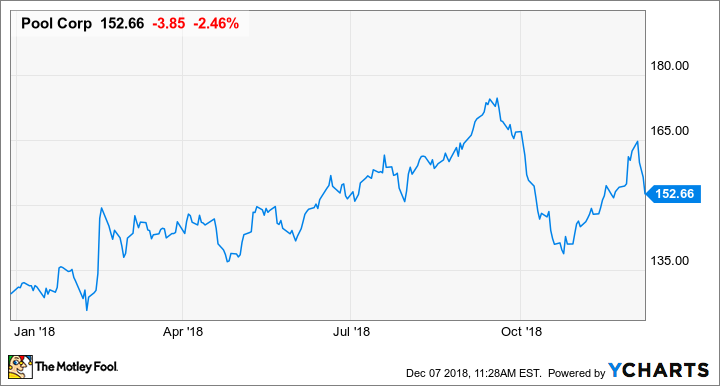 Given that the company gave its third-quarter earnings on Oct. 18, it's pretty clear that the market had some skepticism going into the earnings report, but the numbers and outlook set the company off on a strong run afterward. Given that nearly 82% of Pool Corporation's revenue comes from the US pool market, it's hardly surprising that its fortunes are seen as tied to US housing market conditions. Rising US mortgage rates and slowing existing home sales must have caused some concern going into the results. But CEO Manny Perez de la Mesa argues that only 13% to 15% of the company's sales are tied to new pool construction. Furthermore, management's projected five-year revenue growth of 6% to 9% involves between 2% and 3% from market share gains and new products, with inflation and the existing installed base growth contributing 2% to 4%. Pool is far from just being a play on new pool construction. All told, Pool's prospects aren't quite as tied to new housing or new pool construction as many investors might think. Moreover, as house prices continue to rise, it's likely that Pool will see a boost from repair and remodeling activity. In addition, with new pool construction currently running 65% to 70% below the previous peak, before the housing bust, there appears to be an opportunity for growth here too. Indeed, third-quarter earnings appear to validate these arguments -- net sales grew 9%, and base business sales grew 8%. Moreover, the market will have been impressed when CFO Mark Joslin outlined the "significant pre-price increase purchases" made by the company in the third quarter. As a distributor, Pool is somewhat susceptible to price increases from suppliers. De la Mesa referred to "greater and earlier than normal manufacturer price increases in 2018 given materials and operating cost pressures," so it makes sense to buy ahead -- something that should help gross margin in the coming quarters. Provided the overall housing market -- and house prices in particular -- holds up, it looks likely that Pool has good growth prospects in the future. Favorable demographic trends (more elderly people) imply increased investment in outdoor activities typically associated with retirement, and Pool expects 6% to 9% annual revenue growth to convert into annual growth of 15% to 20% in earnings per share. Given the 9% growth in the third quarter and analyst expectations of nearly 8% revenue growth in 2018, Pool looks well set for growth.